Yesterday was a great day in London. Like this past week, the weather was warm with a chilly breeze, crisp air, and clear blue skies. We may not get the same Fall colors as you do in New York, but it was a lovely Fall day for London. After an intense week in the office following LFW, I decided to unwind with great company and try new food on Broadway Market. Here's what we had. 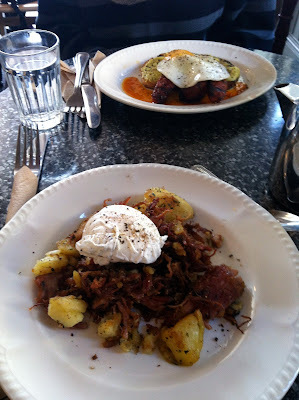 Started the day with brunch at the Market Cafe, which surprisingly got a good review by Guardian's Jay Rayner. It's sweet inside and reminds me of Dorothy's house in the Wizard of Oz complete with old school granny wallpaper and could use a wrap around porch. My sis-in-law discussed the future and our dreams over ham hock hash with roasted potatoes/poached egg and chorizo/avo/egg on toast. 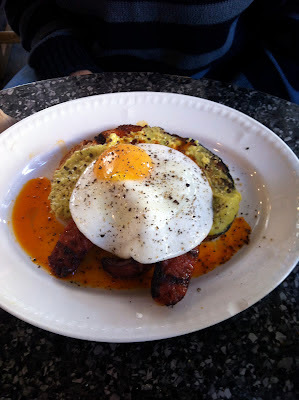 I'm kind of on a chorizo kick at the moment and I love sopping up all that red oil with bread. YUM. We decided to walk off our food babies with a stroll around Victoria Park and Hub joined us. It's getting livelier and livelier in our neighborhood and while cyclists might complain, I like the crop of floating shops that are lining up Regent's Canal. We had a bit of gander and I took it as an opportunity to see what a boat house looks like. 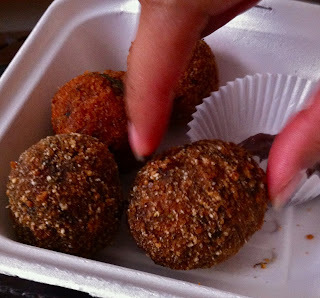 Afterwards, Hub and I got the munchies so we stopped into the schoolyard market and picked up some arancini - fried risotto balls in wild mushroom & pecorino, chorizo & saffron or goats cheese with sundried tomato. AMAZING. 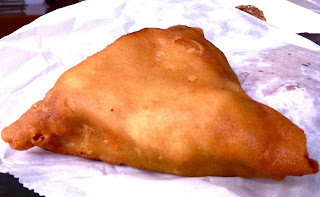 We also picked up the best vegetarian samosa you'll ever have. These ladies also have a vegetarian restaurant on Bradbury street. I'll let you know when we check it out.